Every so often my neighbor brings things by. She has really quirky tastes, like me. It's a match made in neighbor heaven. Couldn't ask for a better neighbor. She used to be a florist and an antique dealer. So she always has amazing finds. Like this. I'm not sure what it's original purpose was, but it looks great on my kitchen wall. 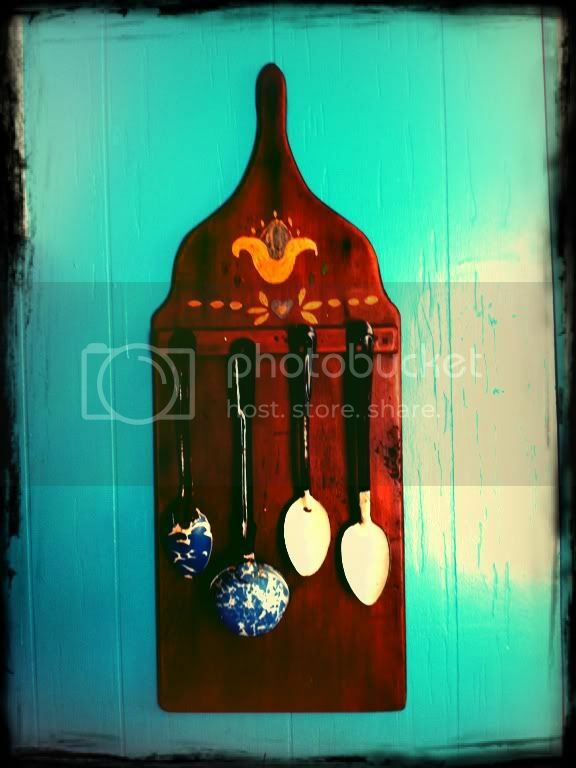 I really love the colors on the serving spoons. They are chipped and very old looking. Certainly not something I'd use day to day. But oh so pretty. And today, she made Punky Brewster super happy by bringing over a mink coat. 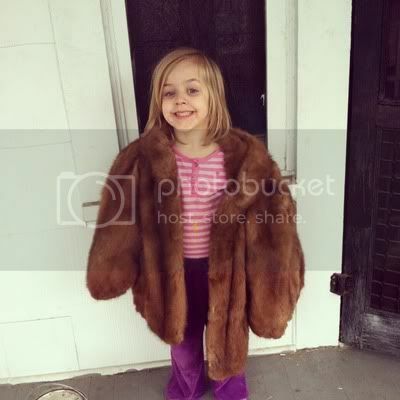 Yes, my 5 yo now owns a mink coat. Miss Cat (that's my neighbor) said her uncle caught the minks himself and had them made into a coat. So I don't feel so bad about having real fur like this in the house...because it wasn't from a mill and it's vintage. Maybe I can find an excuse to wear it some time with the vintage hats I picked up. Love the spoons AND OMG a mink coat, lol! Your daughter is adorable in it! If she gets tired of that coat, you can send it my way!